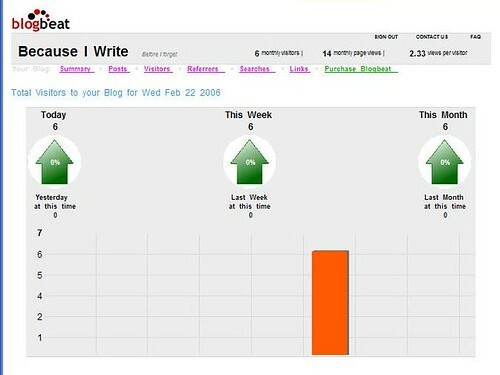 Discovered this web service called BlogBeat from a post in Techcrunch. You can register free for 30 days thereafter subscription is $6/month. Judging from the name I think their target customers are bloggers but why would bloggers pay $6 for such services. I guess unless you are professional bloggers earning far more than $6/month from adsense and really want the statistics to improve your site to attract more clicks. What about tons of good plugins available to WordPressors which could do similar things? No harm done anyway to try for 30 days. See my stats below after few hours of registration.